Let's be honest, people like to conduct business with real people, not robots. After many lessons learned and risks taken, the business world is moving in a good direction towards "human to human" and helping each other out. As humans we tend to favor human interaction, relate with one another and customers like to know who they are doing business with. On top of that, it is much easier to demonstrate what your company is all about by showing, not telling. Did you know that 1/3 of time spent by the average person online is on watching video? Video marketing is a big deal today. See Digital Sherpa's 25 Amazing Video Marketing Statistics here. What's a better way to show off who you are than in a short (fun) company overview video? Today we are showing our company overview video... that we made ourselves in house breaking down what we do and communicating it in under two minutes. 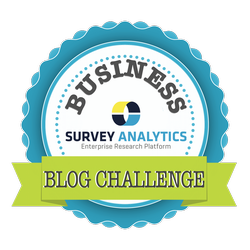 We hope you like it and look forward to seeing yours as well if you are on the quest to complete our Business Blog Challenge. To elaborate more on our company overview, we are a relatively young company with big ambitions. Back in 2002, we started in a garage like many other startups in their early days. We are a company with an innovative vision to help companies listen. Learn more from our President Vivek Bhaskaran about our first customer in a previous post. Because we are 100% privately owned and have grown our business organically, we have no external investors or venture capitalists to answer to. This means we have our own agenda, team collaboration and we can make our own decisions that we see fit at any time to improve our bottom line. We offer a lot more than just surveys; we have panel management and community building, tools for developers (API, SDK), real-time analytics and reporting, basic text analytics and much more. Our surveys are conjoint, TURF, and MaxDiff ready, as well as available in over 30 different languages to collect feedback on a global scale. We thrive on forming long-term relationships with our clients, not just transactional purchases. Learn more about some of our customers and who is most likely to work with us here. Or, to learn more about our company culture and what we believe, check out our CultureCode presentation on SlideShare that caught their eye and was featured on their homepage earlier this year!